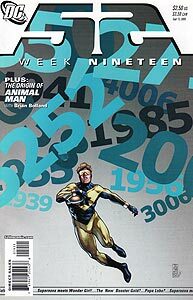 Cover Description: Daniel Carter, dressed as Booster Gold, races through a field of numbers while holding Skeets II. Brief Synopsis: New heroes step in to replace fallen predecessors. Issue Notes: Booster Gold does not appear in this issue. Both Supernova and Daniel Carter, Booster's ancestor, do. Daniel Carter appears on the cover as Booster Gold II. EXTRA, EXTRA: Booster Gold appears in an outdated photograph on the cover of the magazine World's Finest Weekly in the Covington, Ohio residence of his ancestor, Daniel Jon Carter. Covington, Ohio is about 80 miles north of Cincinnati, where Skeets II held Booster's funeral. Either Daniel commutes over an hour to Cincinnati, or he took a very long lunch break for the funeral. "Week 19, Day 3." After rescuing several Metropolis citizens from the Weather Wizard, Supernova meets Wonder Girl II. Wonder Girl believes that under the mask of Supernova hides a resurrected Superboy III, who sacrificed his life during Infinite Crisis. PRODUCT PLACEMENT: Booster is such an excellent salesman, even Skeets can get in on the deal. On the wall behind Wonder Girl is an advertisement for Skeetles Candy, featuring the image of Skeets II. 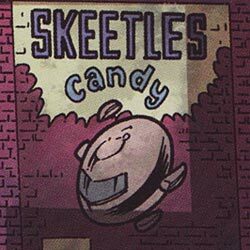 Skeetles is no doubt inspired by the Masterfoods fruit-flavored candy Skittles. Boosterrific Review: The next chapter in the adventures of Booster Gold begin as Skeets II promotes Booster Gold's ancestor into the role of his successor. In doing so, a villainous secret is revealed that will become increasingly relevant as the series continues. Meanwhile, the guessing game of who wears the mask of Supernova begins.